Harlow Farm has been in the Harlow family since 1917 and has been certified organic since 1985. 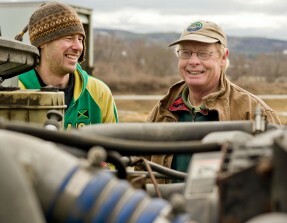 Owner Paul Harlow, is the third generation to farm the land. Today Paul and many hard-working employees raise about 150 acres of organic vegetables, sold at their farmstand and at grocery stores and cooperatives in New England and along the East Coast as far south as Florida. Lettuce, which grows well in the rich, well-drained soils of the Connecticut River Valley, is one of their largest crops. They also grow lots of beets, carrots, sweet corn, squash, kale, and cabbage. Paul has been a huge supporter and close partner of our work since the beginning and was instrumental in establishing the Food Hub as we know it today.